With so many online course platforms out there today, you probably feel overwhelmed by the decision over what you should use. In frustration you pull at your hair feeling stuck between a rock and a hard place. We want to help ease your decision and also clarify some of the real differences… because to find out which platform works for you, you need to look at more than just a comparison sheet. You need to understand how those features work together and how they’ll fit your business needs. So today, we’re going to look at a comparison between two online course platforms, Kajabi and Thinkific, so you can make a better, more informed decision for which platform to use. What are Kajabi and Thinkific? Kajabi and Thinkific are both CMS (content management system) platforms that allow users to create, publish, and sell online courses. That means you can upload your own content, whether it’s in the form of video, audio, text, etc. and create a full online course that contains lessons and categories. Both platforms give power to entrepreneurs because it allows them to sell these online courses however they want and at whatever pricing they want. Let’s take a look at each platform’s’ core feature: online course creation and delivery. 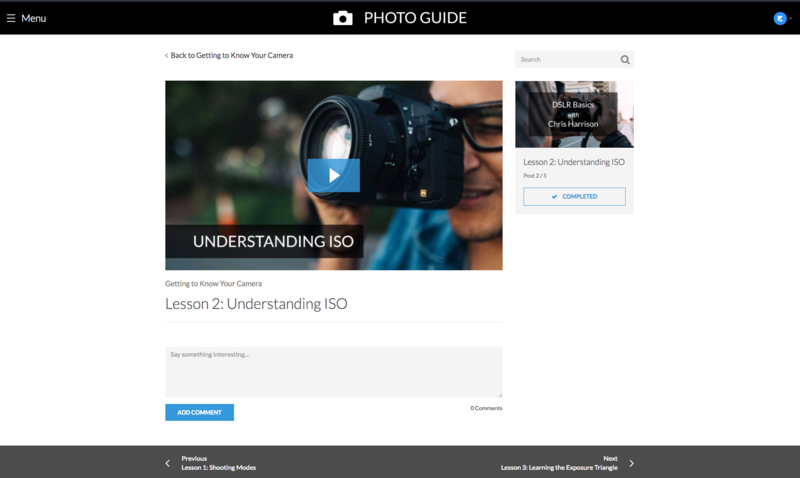 Both platforms allow you to create fully immersive online courses with lessons, discussions, and attachments. There’s also no limit to the amount of content you want to upload for both. As far as selling your products, both platforms offer similar flexibility: bundling, different payment options, and upsells. They both use a built-in payment processor via Stripe so you won’t need to get your own third-party shopping cart. Thinkific does not, however, offer multi-currency so you may potentially run into issues if you’re trying to build a global business. Where the two platforms start to separate is in the look and packaging of your online courses (we’ll dive more deeply into this in a bit). 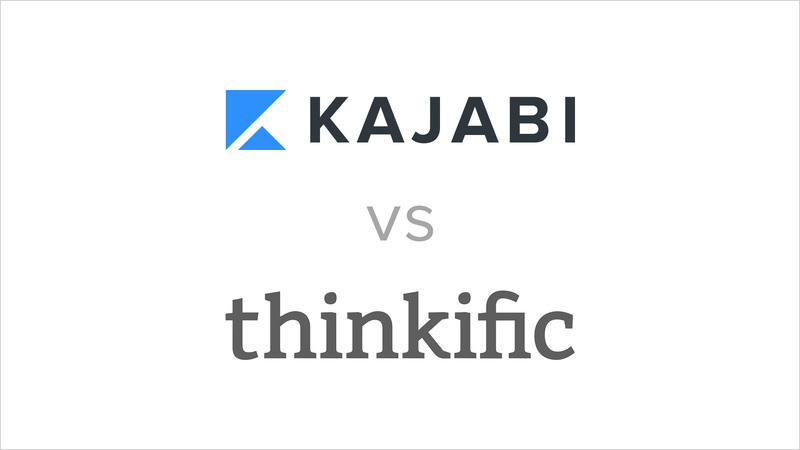 Here’s where the differences between Kajabi and Thinkific really start to magnify. 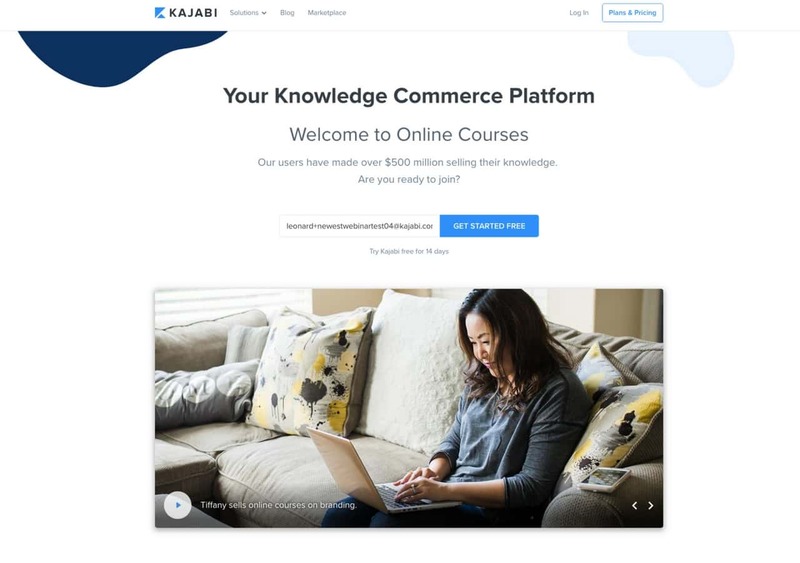 With Kajabi, not only are you getting a platform that lets you create and sell online courses, but you also get all the tools you need to build your list and grow your prospects. Thinkific gives you the means to deliver products, but as far as growing your business, you’re on your own. For you that means you’ll still need to sign up for different services, such as an email marketing platform and a landing page platform, to sustain your business. Kajabi has all of that baked in so you can build an entire business starting from scratch. First off, what are landing pages? Landing pages are standalone pages meant to drive a specific action. In other words, they are pages you use to get your visitor to opt-in with their email, purchase a product, download a file, etc. Since they are singular in their purpose, it makes it that much easier to get high conversion rates. You simply cannot grow a dedicated audience without landing pages, and luckily Kajabi has them in spades. For you, that means you can build Kajabi landing pages to start capturing new leads and collect email addresses in exchange for a lead magnet (e.g., a PDF download) or even a free online course. 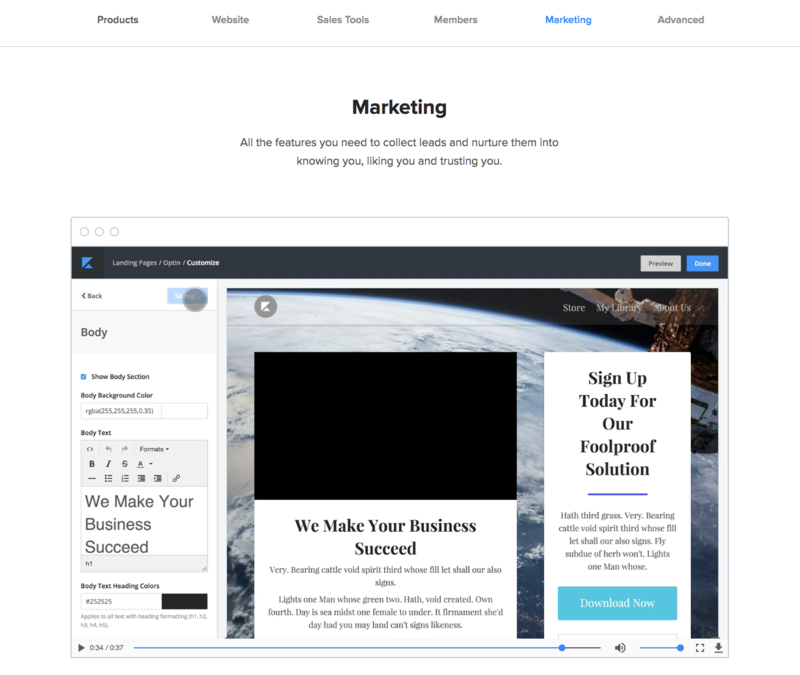 Or you could create a long-form Sales Page to convert traffic into buyers of your online course. Thinkific does not have Landing Page functionality so you will need to use a third-party platform to build them, and you will need a CRM (customer relationship management) to store the data that is being collected. It’s not enough to just collect emails - you need to build relationships with your prospects if you want them to pull out their wallets and buy from you. 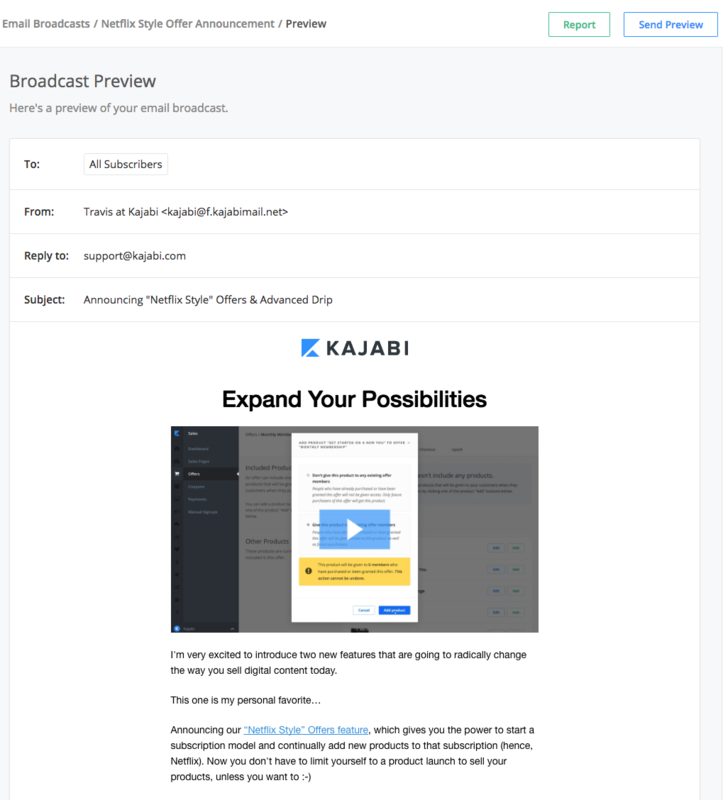 That’s why Kajabi comes with email marketing, in the form of email broadcasts and autoresponders, so you can turn those cold leads you captured into customers. 1. Once someone lands on your Kajabi squeeze page and opts in for a lead magnet, you can put them on an Kajabi email sequence. 2. This email sequence will drip out emails that provide more content so your prospect knows you have a ton of value to give away, and they’ll begin to trust you as a legitimate authority. 3. Eventually, with the relationship between you and the prospect is solidified, you can ask for the purchase and they’ll be that much more likely to buy. All of this is done automatically inside Kajabi. Since Thinkific does not come with any of these features so you’ll need to pay for a third-party email marketing service and then you’ll need to figure out how to connect it with your online course platform. Kajabi even offers a pipeline feature that builds out your marketing funnel for you. Pipelines help you automate the process of growing your business and nurturing your prospects. There’s no more wasting time trying to figure out what you need to do or figuring out how to build a funnel. All you have to do is choose the type of Pipeline blueprint you want to create and Kajabi handles all of the technical stuff for you. Here’s an example of how you can use one of our pipelines to grow your business. First you pick which type of blueprint, in this case we’re going to use a free report. Next, you would give your pipeline a title and upload your free pdf. and let Kajabi do it’s magic.You’ll then see that it gives you the layout of your marketing funnel. In this example it gives you an opt-in page which is your email capture, email sequence and thank you page. All you have to do in design the opt-in page and thank you page, upload your free pdf., and write out the email. Once you’re done, it’s ready to start building your email list! Pipelines are a great feature to use to build your business no matter what level of experience you have. The days of having to schedule webinars are over. With just a few clicks, you’re able to run your webinar on autopilot with Kajabi’s events feature. You can get paid attendees to your live event. The events feature is great to use when you’re not physically there but you still want to offer free content or teach a training. In order to host a webinar on Thinkific, you need a webinar hosting platform such as YouTube or Zoom to send you customers to. Depending on which third party integration you choose, some may cost extra. Both platforms give you the option to create assessments or quizzes inside a product to test your customer’s knowledge before moving on to the next lesson within your course. This is a great way to make sure your students are consuming the course and getting value out of it. Kajabi lets you use the assessments feature to collect information from potential customers. For example, if you want to see if someone is already a coach or just starting out you can segment them based on their answer. 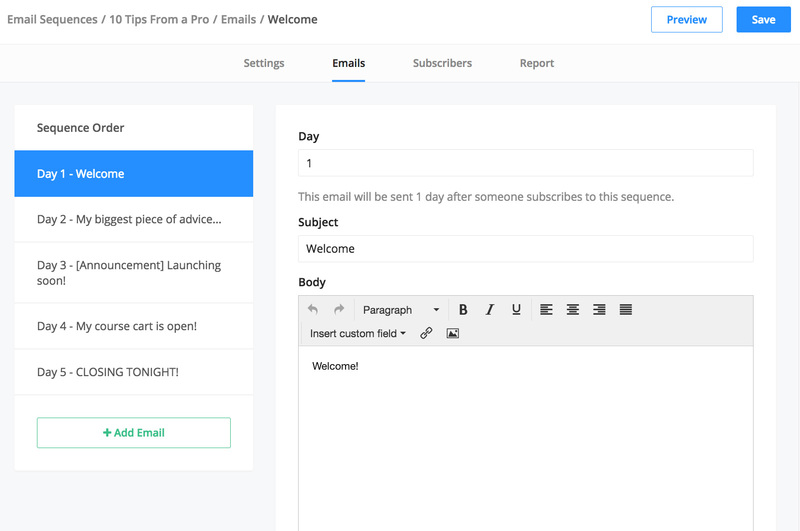 From there, you’re able to send your emails to certain lists. This is just the tip of the iceberg for power that Kajabi gives you for growing your business. It’s practically the entire A-Z from turning cold traffic into customers, and everything works together inside the platform. All of this is essentially non-existent with Thinkific. Marketing is a huge piece of the puzzle when starting an online business and it will come into deep consideration when evaluating platform pricing later. 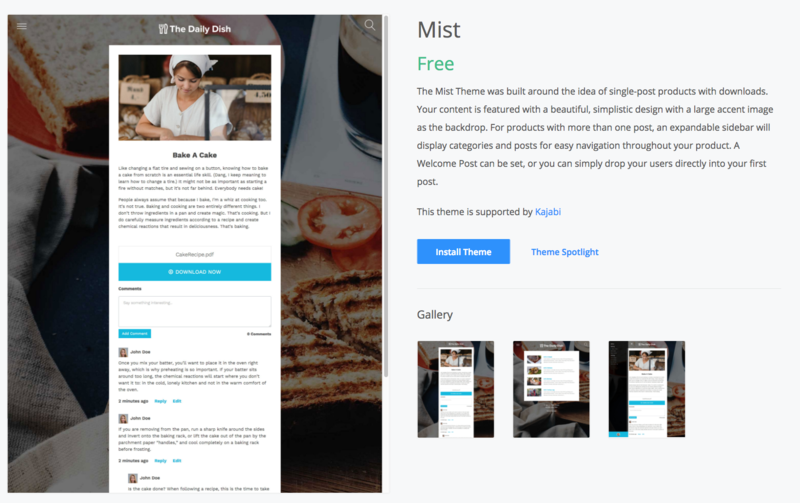 As for the website builder goes, they both offer theme templates and the drag and drop feature. However, the on boarding process of Kajabi offers a smoother transition for the beginner level. 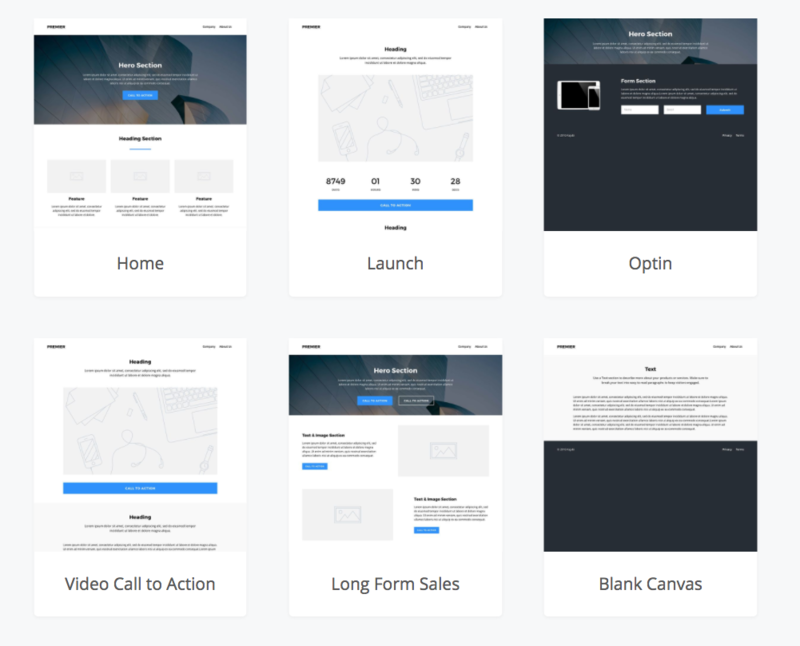 You first start out by choosing a theme template for your site. Thinkific currently offers 3 different themes whereas Kajabi offers over a dozen different theme options. From there you’re able to build your own website using drag and drop functionality. All you have to do is use your own branding and copy. Both platforms do give you a custom domain and host that domain, so there’s no need to use a company like BlueHost or Go Daddy if you don’t want to. Another feature that Kajabi offers that Thinkific doesn’t is the built-in blog feature. You are able to have your website and your blog all in one place. If you already have a blog set up, you’re able to link your website to your blog using either platform. When building your website, it’s nice to use a platform that has everything all in one place and still gives you the customization. 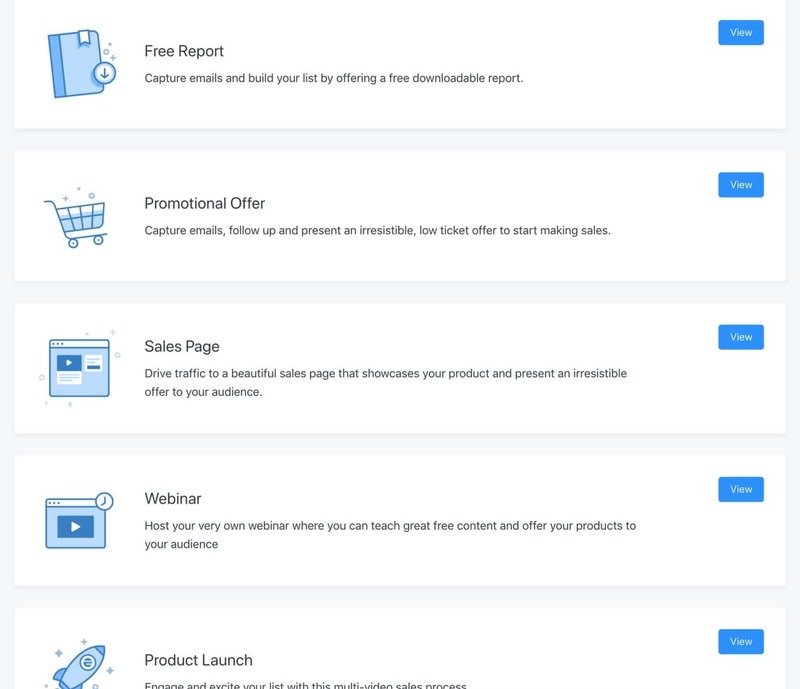 What Kajabi also does differently than anyone else is that Kajabi has themes that are more specific to the type of digital product you want to create! Sometimes, you might not want to sell an online course - you might just want to sell a digital download. Well, you're going to want a theme that is more appropriate to a small digital product, not one aimed to resemble an online course with a syllabus, chapters, or whatever. Kajabi gives you the power to do that by giving you any type of theme you need to suit what you're trying to accomplish. 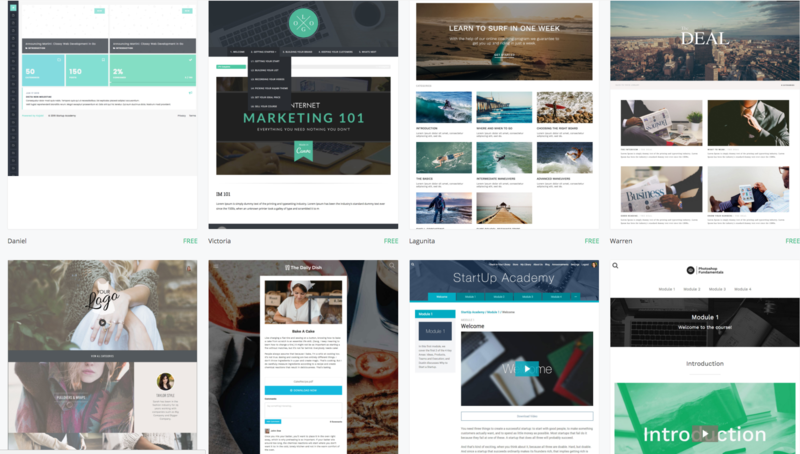 Just by having more professional, beautiful looking templates for both your entire website and online courses, you’re going to significantly raise the perceived value of your products. Great support is a feature. If you’re stuck on a step while creating your online course and you can’t reach anyone for help nor can you find an answer in the help docs, then you’re just wasting time, money, and energy. Both platforms pride themselves on excellent support but how do they stack up against each other? Well, for starters, both platforms come with extensive help documentation, training courses, and even support emails. The main difference between the two is that Kajabi has Live Chat whereas Thinkific does not. So you have to ask yourself how important is Live Chat to you. Do you often find yourself stuck on something and you need immediate help? Do you prefer the experience of having someone help you right there in the moment? Do you dislike the back and forth nature of sending in support emails? If you answer Yes to any of these, then Live Chat is a key feature that you are going to need to help you run your business. Now that we went over major features between Kajabi and Thinkific, now is a good time to go over Pricing. Between both Kajabi Pro plans and Thinkific Advanced plans (comparative in nature), Thinkific is a more cost-effective solution. But as we have seen in this post, you’re not saving as much as you think on Thinkific because of the amount of money you would be spending on other services just to make up what Kajabi offers. Email marketing platforms, landing page services, CRMs, etc., can be costly so these have to be factored into your decision when choosing an online course platform. Thinkific works best as a back-end to your online courses. Thinkific does have a store-front page and you can build static pages, but it’s not dynamic or flexible enough (for starters, there’s no opt-in forms) to act as your home on the web. 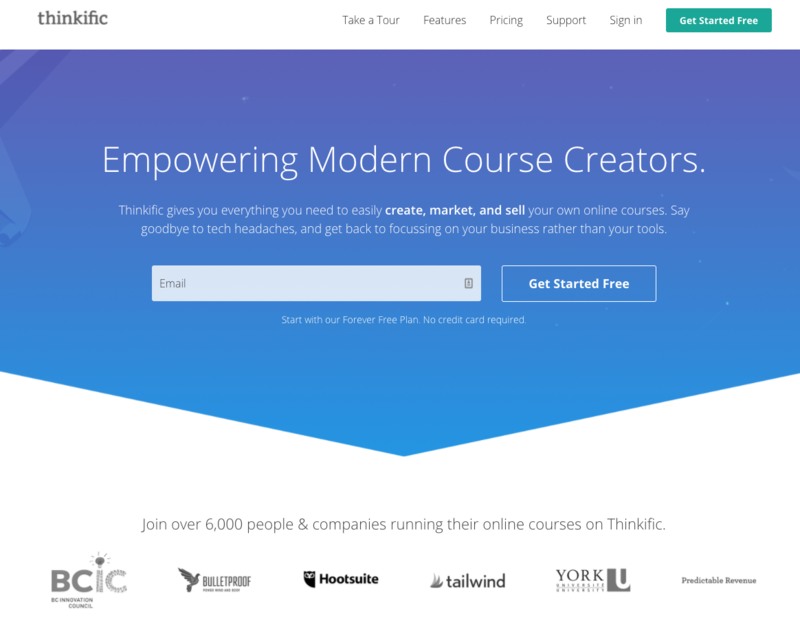 So if all you want is a platform to help you create online courses and you have everything else taken care of, then Thinkific can work for you. But if you don’t want to use multiple different services, you’re tired of duct-taping different tools, and you want everything in one place, then there's no question that Kajabi is the superior platform. 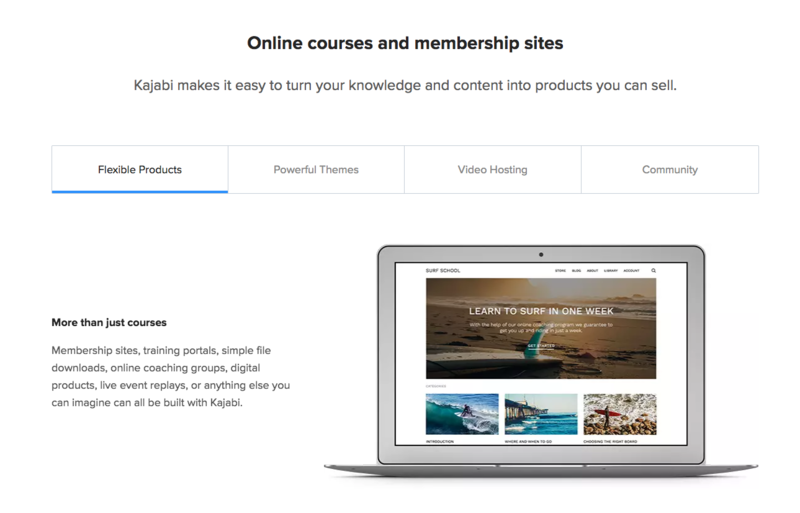 Kajabi gives you everything you need in one place so not only can you create and sell beautiful online courses, you can run your entire business. This is barely scraping the surface of everything that Kajabi can do for you. Imagine all the time, money, and energy you’d be saving if you went with Kajabi instead of using a platform whose main purpose is to build online courses. Don’t take our word for it. Try Kajabi yourself for free today and see what life could be like if you had everything you needed in one place. Start Building Your Business With Kajabi! Get Started With Our 28 Day Challenge Today!